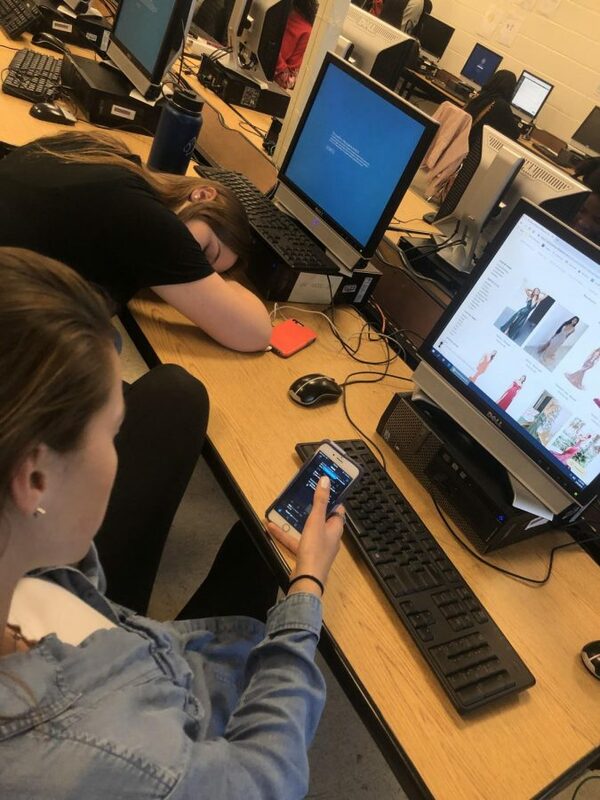 Senior Annie Riley and Lauren Flandrau showing a prime example of senioritis. Naps, twitter and online shopping! It is getting toward that time of year when seniors begin to lose all motivation to work, then disappear altogether. These mysterious symptoms rapidly increase in seniors, especially around this time of year, and are commonly dubbed “Senioritis.” Senioritis is a supposed affliction of students in their final year of high school or college, characterized by a decline in motivation or performance. Seniors deal with “the itis” in different ways. Some resort to isolation, whereas others distract themselves with other responsibilities. “Honestly, I’m just trying to get through [senior year] in one piece. I know I have so much to do, but I just can’t find the motivation anymore,” senior Jordan Gaboton said. “I can’t even remember the last time I was in school for an entire week, let alone an entire day,” senior A’shanti Roger added. There is the rare occasion that Senioritis actually pushes students even harder, no matter what the reason for it is. For some seniors, parents leave no room to take even a second to breathe. “I have senioritis for sure, but my mom makes sure I stay on my work. She’s not having it if I slack off,” senior Sam Berhanu said. “Senioritis is absolutely real, look in a senior English class after lunch,” assistant principal Eric Jackson said. Jackson said that he personally never experienced “the itis,” because in 1979 when he graduated, “we were battling whooping cough and tuberculosis.” Jackson jokingly suggested that any seniors who are suffering should invest in Mountain Dew to power through the next few months. Even teachers notice this epidemic. Although it annoys them and they try with every fiber of their being to get students to actually do work at this point, some have a sympathetic side. “We were all in high school once. We know what senioritis is, I mean we probably all had it ourselves. I can tell you I [did] my senior year,” English teacher Jamaly Allen said. “I have seen a lot of seniors who start off strong in marking periods one and by the end of marking period two they start to fall off and get lazy, scrambling and stressing themselves out more than they need to be just so they can pass classes,” counselor Michelle Kuntz said. Let’s just say this. Seniors, we can do this. Only three more months to go, just keep on pushing. And teachers, please cut us some slack. *Cough cough IB English* We are trying.